There is perhaps no other children's novel better known than Alice's Adventures in Wonderland, which has been reinterpreted broadly, from Disney's beloved film to Robert Sabuda's clever pop-up to Frank Beddor's new fantasy novel. 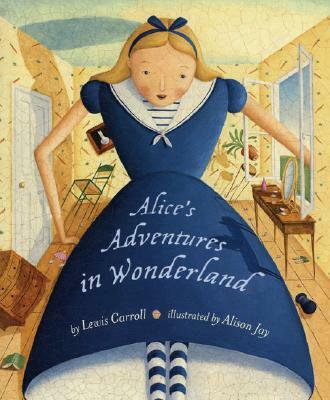 Lewis Carroll's whimsical, fantastical tale grabs every reader's imagination, and it is an artist's dream, bursting with visual possibility. Alison Jay has long wanted to bring her own perspective to the story. Now she shows us an exhilarating Wonderland, where Alice, the White Rabbit, the Mad Hatter, and all the rest are playfully quirky and adorably fanciful. With the complete, unabridged text and glowing full-color illustrations on nearly every page, this lavish edition is the perfect introduction to the novel--and an elegant gift for those who are already Lewis Carroll fans. Charles Lutwidge Dodgson, known by his pen name, Lewis Carroll, was a man of diverse interests - in mathematics, logic, photgraphy, art, theater, religion, medicine, and science. He was happiest in the company of children for whom he created puzzles, clever games, and charming letters. As all Carroll admirers know, his book Alice's Adventures in Wonderland (1865), became an immediate success and has since been translated into more than eighty languages. The equally popular sequel Through the Looking-Glass and What Alice Found There, was published in 1872. The Alice books are but one example of his wide ranging authorship. The Hunting of the Snark, a classic nonsense epic (1876) and Euclid and His Modern Rivals, a rare example of humorous work concerning mathematics, still entice and intrigue today's students. Sylvie and Bruno, published toward the end of his life contains startling ideas including an 1889 description of weightlessness. The humor, sparkling wit and genius of this Victorian Englishman have lasted for more than a century. His books are among the most quoted works in the English language, and his influence (with that of his illustrator, Sir John Tenniel) can be seen everywhere, from the world of advertising to that of atomic physics.